DRS (Dynamic Resonance System) is the new exclusive CETMACOMPOSITES innovative system. 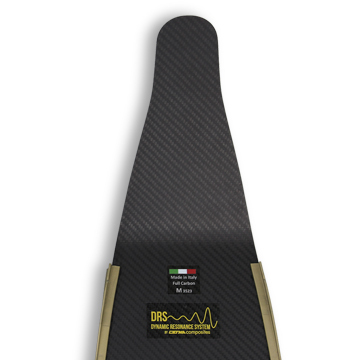 This feature (DRS) is designed to allow the MANTRA blade to match resonance in a certain range of finning frequencies. The resonance phenomenon, in fact, is a well-known physical phenomenon which characterizes any structure. Simplifying we can say that when a structure is forced with a frequency close to its natural frequency the amplitude of vibration increases in a very efficient way (low damping). Through the engineering design has managed managed to distribute the stiffness and the mass of the blade in order to "tune" the blade in a certain range of natural frequencies next to those of the kicking frequency, thus allowing the resonance phenomenon. The end-user feedback is therefore a very low effort corresponding to an incredible propulsion. This study is done using a laser vibrometer (LDV) for performing a modal analysis, which has used to establish the optimum mass distribution and stiffness of the blade.